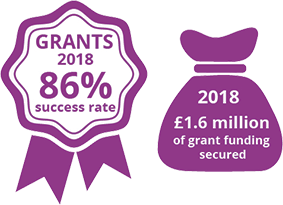 The Triangle Trust holds one round of Development Grants per year for organisations working with carers, and one round per year for organisations working with the rehabilitation of offenders or ex-offenders. This ensures applicants have a higher success rate and high quality applications are not rejected, compared to holding two or more rounds with lower success rates. The application process is two-stage. Following the submission of your initial online application, shortlisted applicants will be asked to host a visit from the Triangle Trust where they will be required to present their strategic plan for the next few years. This Development Grant scheme provides core funding to support organisations to implement a step change in their development and therefore build increased resilience for the future. Grants are available from £10,000 up to £80,000 for a duration of 6 months to 3 years. The funders are open minded on the type of initiatives applicants may wish to develop in order to increase their resilience. Appointment of a Trust or Community Fundraiser. Expanding the coverage of a particular service, unless there is a tangible increase in resilience as a result. Match funding, unless associated with a specific development. Covering the loss of a statutory contract or grant income. New permanent posts, unless a concrete plan is included in the application about how the post will be funded after the grant ends.